Aggregation is a relationship between two classes . That is , an object “has-a” relation with another object. Lets take an example of the relation between a Person and Address. There is an aggregation relationship between person and Address. Here we can say that a Person class has address object. Person does not manage the lifetime of Address. If Person is destroyed, the Address still exists. Below code will help you to understand java implementation of Aggregation. The address object is created outside and is passed as argument to Person constructor. When this person object is destroyed, the address will be still available. We can say that composition gives us a ‘part-of‘ relationship. Composition is represented with a filled diamond. In any application Classes are not directly used. But instance / Object of the classes are used for executing the business logic. Representing the relation between these objects at any point of time is called Object diagram. With the help of an object diagram we can understand how the classes are interact at run time. 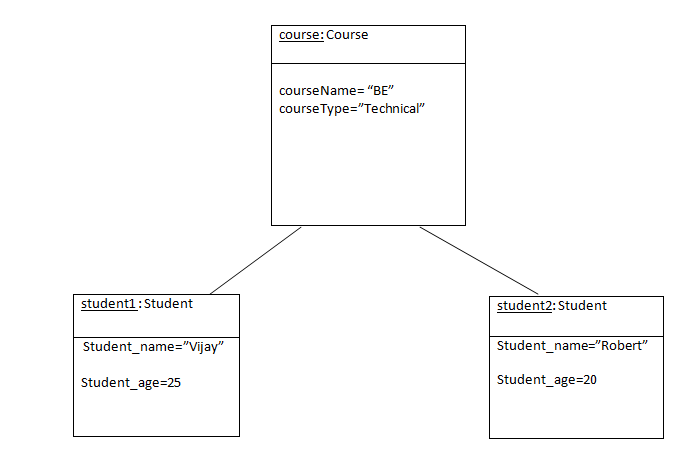 As object diagram is the instance of classes, it consists of same element as the class diagram. Example: Let us consider the example of Course and Students class. The class diagram for this can be as below. Here we can notice that a course has many Students, We can represent the same at the run time using an Object diagram as below. • Visualising. Firstly, The UML is more than just a bunch of graphical symbols. The UML notations are supported by well defined semantics. Using UML, one developer can develop a model, which can be easily interpreted by another. Secondly, there are a number of things about software which can not be easily comprehended. For example, looking at a code one may infer the classes by looking at the hierarachy, but how they relate to each other and what conditions apply to their operations can not be easily grasped. UML’s graphical notations help visualising these details. Finally, a developer who wrote the code does not write down the model, the information would be lost forever. • Specifying. UML addresses all important analysis, design, and implementation decisions that must be made in developing and deploying software systems. • Constructing. UML is not a visual programming language. But its models can be directly connected to a variety of programming languages. This means that UML models can be mapped to programming languages like C++, Java, Visual Basic etc., or even to RDBMS tables. • Documenting. The very approach of developing models using UML is conducive to capturing all analysis, design, implementation, packaging, and deployment issues of a problem in well structured and defined models. By providing additional flexibility to its language, UML helps in expressing requirements for tests as well.